The Tennessee State Tigers held on to win the 26th Southern Heritage Classic Saturday night 17-15 over Jackson State. 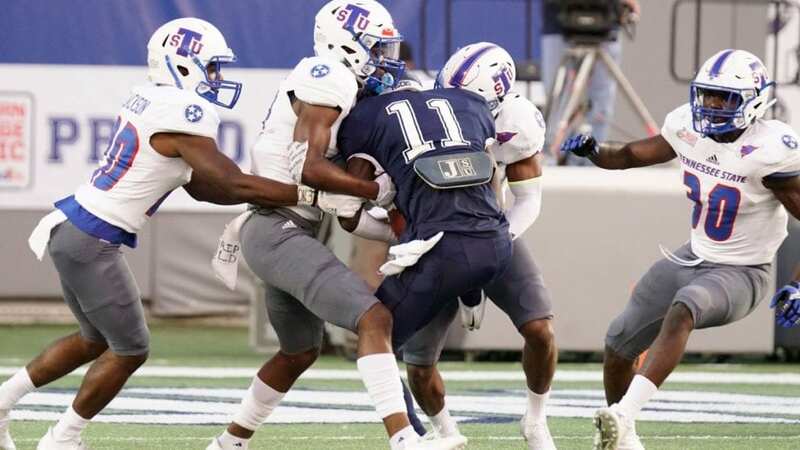 NASHVILLE, TN — On a night when their offense repeatedly misfired, the Tennessee State Tigers’ defense made a host of clutch plays and enabled them to grab a 17-15 Southern Heritage Classic victory over Jackson State before nearly 48,000 fans at the Liberty Bowl in Memphis. The Tigers got the win despite being dominated for long stretches, only getting 11 first downs and Jackson State having the ball for almost 34 (33:38) of the game’s 60 minutes. TSU QB Treon Harris had a dreadful passing game, completing just five of 17 passes for 78 yards. But he was also the team’s leading rusher with 91 yards, and his leadership and poise led to his being selected as the game’s Most Valuable Player. The Tigers also got a game-winning 57-yard punt return from Patrick Smith. That second half play put TSU ahead 17-9, and when Jackson State got a 91-yard kickoff return for a touchdown shortly afterwards they had to go for two. It failed, and the Tigers’ defense held the rest of the game. They even overcame a late fumble that looked as though it would be costly. Jackson State missed two last-second 48-yard field goal attempts as well, either of which would have won the game. Still, it was due to the performance of the defense that TSU was even in the game. Despite multiple times getting in the red zone, the defense didn’t give up an offensive touchdown. Either Blair Edwards, who had 12 solo tackles, one off his career high, or Chris Collins with 10 tackles, could just as easily have been voted MVPs. They held Jackson State to just 107 yards rushing. Defensive back Laquarius Cook also broke up the pass on the two-point conversion and added an interception. The Tigers entered the game ranked 23rd in the country, and most likely will remain somewhere in the lower end of the Top 25 with this victory as they improved to 2-0 on the season. They also will look for offensive improvement when they travel to Florida (assuming weather permits) for their next game with longtime rival Florida A&M. See our photo galleries section for more photos.